This virtual product presentations allow users to something online that they can’t even do in bricks and mortar store, get inside the cellophane. Potential customers can open the CD case, read the liner notes and in many cases listen to sample tracks right online. 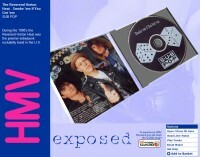 This presentation template was produced at Cycore North America for use by HMV.com’s Exposed section as a means of showcasing new talent. The model, interface art, programming and documentation were produced at Cycore. HMV staff re-skinned the presentation template with art scanned from actual product. Using this methodology HMV was able to economically post 10 new virtual product presentations a month.